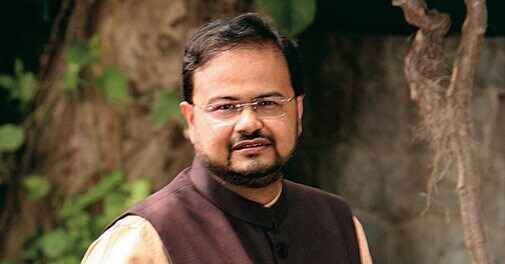 Gautam Sinha, Director of Indian Institute of Management (IIM) Kashipur, has the most unenviable job among his peers. His institution is the only IIM (of the 13 that dot the country today) that is not located either in a state capital or a large town. With a population of around 1.2 lakh, the dusty little town of Kashipur in Uttarakhand has poor air connectivity (the nearest airport, New Delhi, is 270 km or six hours away by road) and rail link (only two trains from the capital and that too at an inconvenient time). The town has no good schools, restaurants or even a shopping complex (forget malls) to boast of. The only source of entertainment is a half-decent cinema hall. 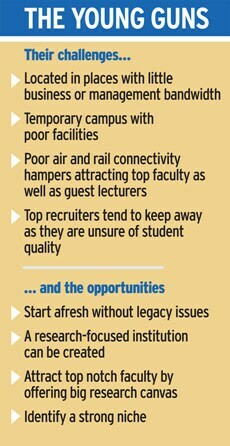 "Under the circumstances how do I attract and retain high-quality faculty," asks Sinha. He, however, is trying his best. "Government norms prevent us from paying a higher salary but I have got the board to approve a special dispensation in the form of furnished accommodation for faculty." Sinha has taken an entire gated community on rent, but up to 16-hour power cuts daily is putting paid to his efforts. With no air-conditioning, TV or fridge, the wives of the professors are at their wits' end. Lack of good schools mean Sinha can either attract only very young professors who are unmarried/without kids, or senior faculty whose children have completed their education. "We try very hard to engage the faculty and their families but what we do is a poor substitute to the overall quality of life here," he says. "We have resigned to the fact that faculty will come and go till Kashipur develops." IIM Kashipur is one of the six new IIMs (others are located in Ranchi, Raipur, Udaipur, Trichy and Rohtak) that were started after 2010 in a bid to expand quality management education in the country. The conditions of other five, though not as bad as IIM Kashipur, are not good either. IIM Ranchi's campus, for instance, is the whole three-and-a-half floor of the Jharkhand government's Soochna Bhawan and the hostel is a good 15 km away. IIM Raipur is just a building and encompasses a class room, hostel and mess all separated by wooden partition. IIM Tiruchirappalli (Trichy) is relatively better off in terms of facilities as it is located inside the National Institute of Technology (NIT), Tiruchirappalli, but has other challenges. "Last year we planned close to 100 lectures by visiting faculty and professionals, but we could execute only 17 due to poor air connectivity," says Prafulla Agnihotri, Director, IIM Trichy. The Trichy airport has more international connections than domestic. This benefits Anand Tilak, Country Head, Facebook Indonesia, who teaches digital marketing. He reaches Trichy from Singapore in just four hours. Compare this with professionals in India who need to allocate two full days out of their busy schedules if they have to give a lecture at IIM Trichy. "It is important that students are provided with all round perspective and get to hear local academics apart from visiting practitioners. Setting up IIMs in smaller cities makes it a little challenging for industry professionals when there are no direct flight connections," says Tilak. But Agnihotri is blunt. "IIMs cannot bring in development. We are parasites who live on the infrastructure to disseminate management education. We are not IT parks. These challenges will have to go away if we have to create a world-class institution." Some problems will indeed go away when all the institutes get their own campus, but even that is still a few years away as some are still awaiting land allocation and a few are just about to commence construction. So given the challenges, how are these institutions faring? If final placements of the students is taken as an indicator, they have managed full placement with a maximum salary of Rs 15 lakh to Rs 27 lakh and a median salary of Rs 9 lakh to Rs 12 lakh. However, this is far lower than what students at IIM Ahmedabad get (maximum salary of Rs 41 lakh and a median salary of Rs 18 lakh). While IIM-A attracts the likes of A.T. Kearney, Bain & Company, McKinsey & Co., Boston Consulting Group, Hindustan Unilever, Reliance Industries and Goldman Sachs, these institutions get ICICI Bank, Mahindra & Mahindra (M&M), SAP India, Cognizant, Accenture, etc. "Our students are as good as any, but the challenge is to get the recruiters to meet them," says BB Chakrabarti, Director, IIM Ranchi. "To make that possible, we invite industry professionals for guest lectures so that they get a feel of our quality," says Vishnu Puduval, a second-year student at IIM Trichy and a member of the external relations committee. 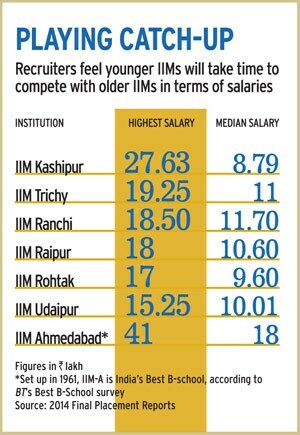 But a cross section of recruiters feel the new IIMs need a few more years to catch up with their older siblings. "The new IIMs hold promise and they have been gearing up fast, though they have some distance to go before they become a part of the premium league. Having said that, the early signs seem very encouraging," says Rajeev Dubey, President (Group HR, Corporate Services & After-Market), M&M. The company last year recruited 13 students from IIMs, including one student from IIM Trichy. But Ramsiva Linga, a first batch student from IIM Kashipur who now works in Tata Steel, disagrees with the view. "At Tata Steel I am considered on a par with my colleagues who have come from IIM-A," he says. The new IIMs are beginning to see opportunity amidst challenges. "Being a new institution offers us an opportunity to build management institute that is based on research that is globally recognised by peers," says Janat Shah, Director, IIM Udaipur. Old IIMs do not do adequate research and having been caught up in the old culture they are finding it difficult to change. "Faculty in old IIMs do a lot of administrative work, which is a criminal waste of time," points out Shah, who has spent 20 years at IIM Bangalore. Also low fees earlier forced older IIMs to start different programmes like executive education to cross subsidise the MBA course. This led to overworking of the faculty who had to consult too to raise resources for the institute. "New institutions can give first priority to research by giving no administrative work to the faculty and limiting teaching to a fewer courses as the new fee structure obviates the need to cross subsidise any programme," says Shah. IIM Udaipur does not get its faculty to do administrative work. It does not have an executive programme and has allocated 20 per cent of its revenue to research. IIM Trichy has managed a strong research-focused faculty (most professors have already published their papers in A-grade journals). "We are a collection of like-minded professionals with a familial binding. There are no silos of individual excellence here," explains Agnihotri. At Kashipur, Sinha is attracting top faculty by sending at least two professors every year to Harvard University for doing research. 'IIM-K was set up in a state that was anti-business, a town which had no business ecosystem and poor domestic air connectivity. We converted challenges into opportunities,' says Debashis Chatterjee, Former Director, IIM Kozhikode. IIM Kozhikode, set up in 1996, offers some interesting lessons for the newer institutions. "IIM-K was set up on a hill top in a state that was anti-business, a town which had no business ecosystem and poor domestic air connectivity," explains Debashis Chatterjee, who just relinquished his role as director of the institute after a five-year stint. "We converted challenges into opportunities." IIM-K began looking for a niche positioning. It embraced digital technology and started digital campus as early as in the year 2000. Today it has as many as 50 centres. Taking advantage of its exquisite location and Kerala's popularity as a tourist destination it began attracting top quality visiting faculty (like Trichy, Kozhikode has more international connectivity than domestic). "We also tweaked the curriculum and teachings to produce students with extreme humility - a virtue recruiters have come to appreciate," says Chatterjee. IIM-K is today among the top 10 management institutes in the country. "There is room for lot more premier management institutions in the country. The new IIMs have to chart a 15-year vision on what they want to do and where they want to be to overcome the challenges and taste success," says Bala Balachandran, Founder and Dean, Great Lakes Institute of Management, which is celebrating its 10th anniversary this year. Directors of the new IIMs agree with this view. "No great institution is built in a day," says Shah. Adds IIM Kashipur's Sinha: "We should also not forget that IIM Ahmedabad began in the garage of Vikram Sarabhai in the early 1960s."